Keep Your Focus on the Road! Whether you're navigating a new city or the car's designated DJ, a phone is a must-have when you're in the car. But when your hands are off the wheel, your driving becomes dangerous. Stay focused on the road with a hands-free phone holder! 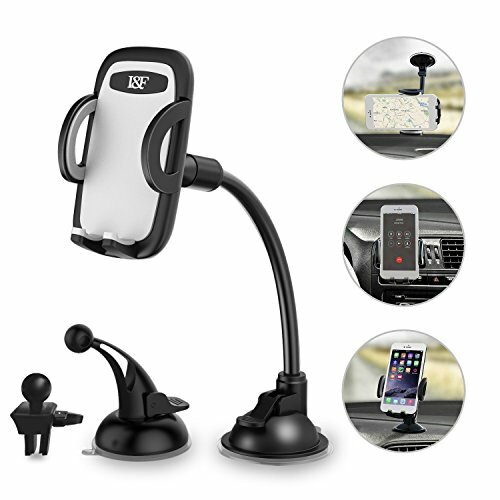 The I&F cell phone holder for car gives you easy access to your phone while your drive, allowing you to safely answer conference calls, change your playlist, and more. We know not everyone wants their phone in the same place. Unlike your cell phone windshield holder or dashboard phone mount, our 3-in-1 multifunctional car mount can be installed on your windshield, air vent, AND dashboard. Enjoy the freedom to place your phone wherever you'll see it best! To reposition your mount, simply unscrew the universal holder from its current mount and re-secure the bracket to the mount of your choice. It's that simple! And with 360° rotation, you can view your device horizontally, vertically or even on a tilt! Why worry if your phone will fit? I&F is perfect for iPhone, Samsung, and more. Our dash mounted cell phone holder is compatible with all smart devices. A difficult dashboard mount can make you dread driving. Invest in a super simple cell phone stand! Our easy-to-use cell phone car mount has a quick release button that lets your device easily slide in and out of place! Unlike other mounts, our universal car mount is strong and won't let your cell phone slip out of place, ensuring safe driving throughout your trip! At I&F, your safety is our top priority. If your car phone holder is more of a traffic jam than a shortcut, send it back within a year of your purchase and we'll send you a replacement for FREE! Drive with peace of mind and add an I&F phone holder to your cart TODAY! HANDS-FREE SAFETY - Whether you're answering phone calls or using your GPS, a cell phone is essential while driving. But your mobile device can quickly become a dangerous distraction. I&F hands free phone holder for car provides you with safe access to your mobile device wherever the road may take you! MOVEABLE MOUNT - While many phone holders dictate where you place your car mount, our innovative 3-in-1 design gives you the flexibility to mount your phone on your air vent, windshield or dashboard. With I&F, you can position your cellular device however you'll see it best. COMPATIBLE CONVENIENCE - Whether you're team iPhone or Samsung, we've got you covered! Our universal smartphone windshield mount is compatible with all mobile devices, so you can rest assured your phone will fit! ON THE GO EASE - Hassling with complicated cell phone holders can turn a pleasant trip into a catastrophe! Stop the stress and get a simple to use dash mount! Our phone holder is designed with a quick release button, allowing you to install and remove your phone with ease! SATISFACTION GUARANTEED - At I&F we take pride in the quality of our products. That's why your purchase is protected with a 1-year, worry-free warranty! If you have any questions about this product by I & F, contact us by completing and submitting the form below. If you are looking for a specif part number, please include it with your message.